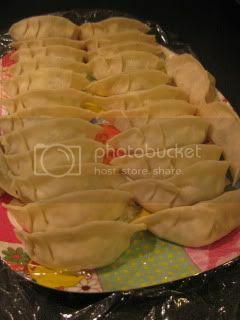 The filling is the combination of shrimp and tofu. 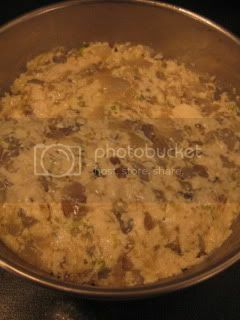 I mixed together 1/2lb of each minced shrimp and firm tofu (drained well by using weight), 1 tablespoon katakuriko (potato starch), 1/2 tablespoon grated ginger, 1 tablespoon Chinese rice wine, 1/2 teaspoon sesame oil, some salt and ground Szechwan pepper to taste. After mixing them well, it was rested in the fridge for 30 minutes. 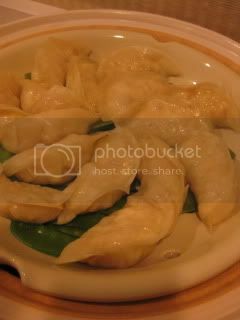 The mixture was wrapped in gyoza wrappers and steamed in donabe steamer, "Mushi Nabe" for about 5 minutes. They were served right at the table with the dipping sauce (soy sauce, black vinegar, and some la-yu). They were brilliant. Each piece was so fluffy and so light, while the flavor was really juicy and deep. This dish is so easy and so quick to make. And, it's so delicious.